Mangalore aerodrome, located near Seymour, Victoria, was first established by the RAAF during the Second World War. The good natural surface was consolidated and the runways were sealed with tar. 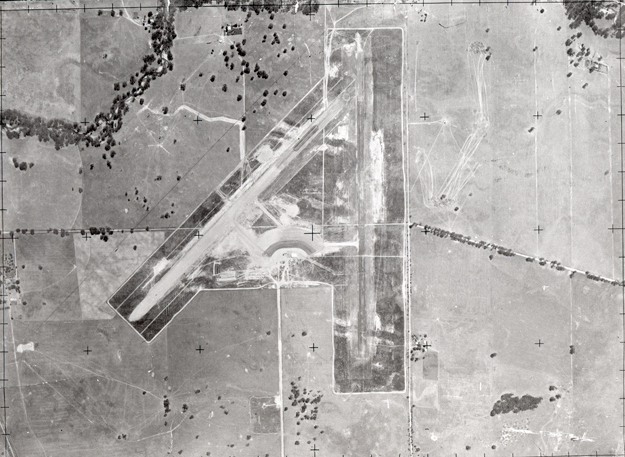 The growth of civil aviation in the post-war years led to the need for a diversion aerodrome for Melbourne when the aerodromes in the Melbourne area were fogged in (there was no ILS in those days). One of the peculiarities of Victorian weather is that when south-westerlies bring low cloud or fog to southern Victoria, it is often trapped south of the Great Dividing Range. In these conditions, north of the ranges it is usually clear. This made Mangalore ideally suited for use as a diversion, being situated as it was just north of the Great Dividing Range. Accordingly, Mangalore aerodrome was taken over by DCA on 1 January 1946. The runways were immediately gravel-surfaced and resealed, taxiways were constructed and an apron to take up to 14 aircraft was constructed. The photo below (oriented north up) was taken about this time and the areas of construction can be clearly seen. The shorter Runway 18/36 appears to be fininshed while the longer Runway 05/23 is still being worked on. In between the runways is a sizeable curved parking apron. For passenger accomodation, a large 'waiting room' was acquired from RAAF Tocumwal. This was intended to accomodate 3-400 passengers, airline offices and a buffet. However, post-war shortages of materials delayed completion of fitting out until 1950 (some terse memos flew over this!). The waiting room can be seen at the southern edge of the apron in the photo above. 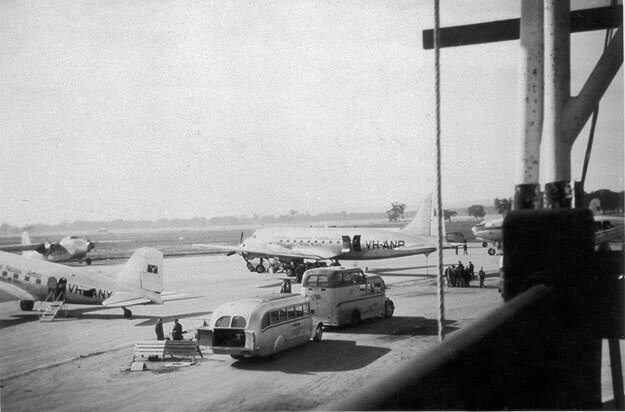 When aircraft were forced to divert to Mangalore, the airlines would charter busses to transport passengers between Mangalore and Melbourne - these busses can also be seen on the apron in the shot below. Not only was Mangalore used as a diversion field, but its proximity to Melbourne where the two major domestic airlines (TAA and ANA) were headquartered meant that it saw constant use for pilot training. For that reason, a Control Zone was established around the aerodrome and a Control Tower provided. A Fire Service was also provided. 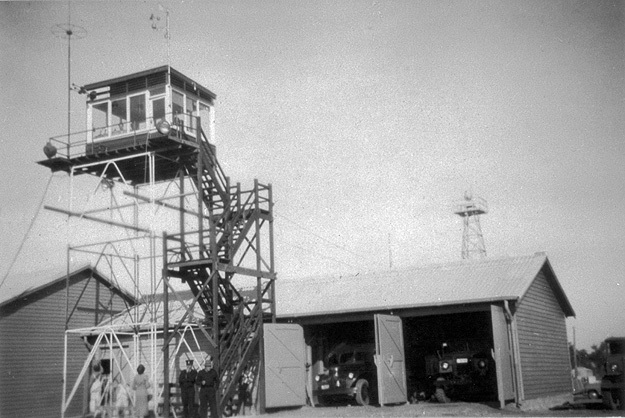 The photo below, c.1950, shows the Control Tower - a typical early post-war box-on-stilts construction - and the Fire Station. The building at far left is the passenger terminal. At this time the Controllers lived on station, but in later years the Controller would fly up to Mangalore in the morning with the first training detail and, hopefully, return home with the last. However, it was not unknown for the last detail to be cancelled, leaving the Controller stranded in Mangalore! ATC Officer manning the Control Tower. Fire Crew (Minimum of 4) manning the Fire appliances. Radio Technician operates the PMG switchboard in the teletype room, and activates teletypes (receive traffic only). This latter duty is taken over by a COM Officer from Melbourne, if relief staff are warranted. Two Auxiliary Firemen handle aircraft passenger steps, this duty should be conducted by spare flight crews and groundstaff Co. [airline company], personnel when available. The remaining staff member marshalls and parks aircraft. Having regard to limited Tarmac and parking space, due to refuelling points, three exit taxiways, one fuel bay entrance from tarmac, careful SMC particularly of a night time is essential. This is best affected by avoiding congestion on the tarmac by regulating rate of arriving aircraft. Spacing arrivals at five minute intervals (approx.) will achieve this, having consideration always to any aircraft having limited holding. The first Flight Captains arriving, for the different companies are responsible for occupying the respective Company Offices and assuming Company Operational responsibilities, arranging with Fuel Agent, fuelling requirements, priorities, etc. In the interests of Controller loading, taking into consideration possible distraction from numerous minor extraneous enquiries, it should be stressed that inter-com phone calls should be totally ignored in retaining an effective concentration on Control duties. Effective assistance in this regard is provided by staff at Melbourne in providing close liaison on the direct ATC line (usually by the SAC) with the Sector 3 Area Controller retaining Control of diverting aircraft, even to the extent of assigning altitudes in the VAR holding pattern, relinquishing control of aircraft to Mangalore on request from the Mangalore Tower. It should be mentioned here that equipment provides for VHF transmissions and reception on the main frequency 118.7 Mcs. on speakers i.e. the P.A. speakers located on the front of the Terminal building, on the Control Tower and in the Mess Room. Passengers from diverted aircraft, can even in the passenger lounge, to some extent hear these transmissions. Procedures for routine training details were rather different. Positive control of training aircraft was required when two or more aircraft were in the circuit, or were conducting airwork requiring separation, but it was not mandatory to man the Control Tower for one aircraft during daylight. 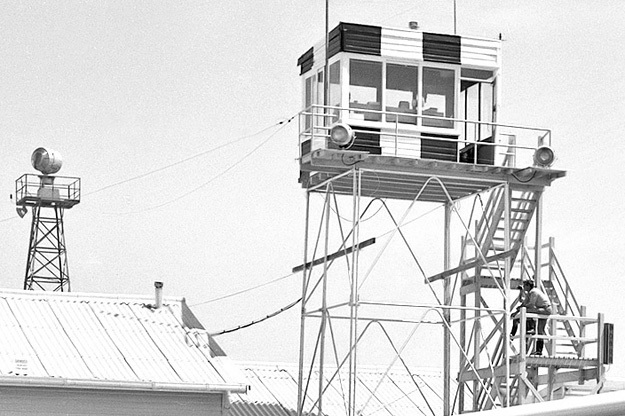 However, if the Tower was not manned (since the Controller was the Senior Officer on the aerodrome and also had administrative work to do) then a Fireman had to be delegated to maintain a watch on operations from the Tower for alerting purposes, with periodic radio checks and other information provided by the Controller from a second operating console in the teletype room. This second console survives and is on display (c.2006) in the Airways Museum. 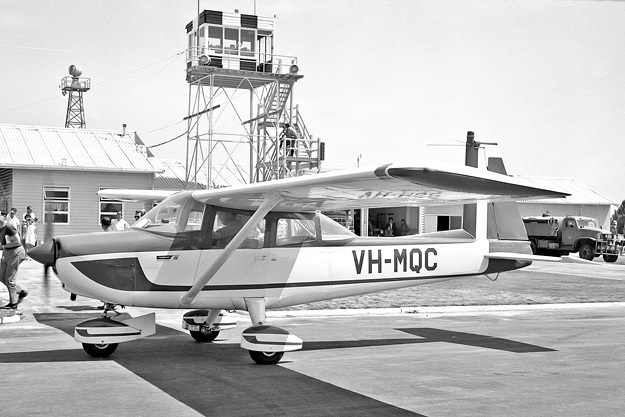 By 1964 the installation of an ILS at Melbourne/Essendon had all but eliminated the need for Mangalore as a diversion field. However, airline training continued unabated until the introduction of flight simulators dramatically reduced the amount of training required to be done in the actual aircraft in the 1970s. The cropped image above (full image below) shows the Mangalore Tower in January 1968. It's still the same rudimentary 1940s structure. Some ponts of interest are the rotating aerodrome beacon behind the Tower, situated across the driveway to the font of the passenger terminal (left of the Tower in these images). Note also the airport fire service truck outside the Fire Station. The aircraft below is a fairly rare Aero Commander 100.